The following article is based on my trip to Rojava in March 2016 where I interviewed Delal Afrin, Head of the Women’s Economic Committee of Kongira Star [Kongreya Star] (a women’s umbrella organisation, previously known as Yekitiya Star) and Hediye Yusuf, Co-President of Cizire Canton (now co-president of the Democratic Federation in Rojava and North Syria established on 16 March 2016). We visited four co-operatives in the canton of Cizire. The newly established co-operative economy is buffeted by more external pressures than one is likely to find elsewhere: Rojava is in a war zone, fighting for its survival against Daesh (ISIS), and has only recently turned its attention to the economy. It is a fast changing situation as the frontline is constantly moving, the Turkish border and the Iraqi Kurdistan (KRG) border are mostly closed although intense political lobbying may allow certain goods to be imported. They do not have the resources to collate statistics and so much of the information feels hazy. For instance, I was unable to discover how much the co-operative sector contributed to the Rojava economy as a whole. The work of the Women’s Economic Committee is mainly to facilitate the establishment of and support the running of women-only cooperatives. It was set up in August 2015. The co-operatives range in size from four women to medium sized co-ops of 60 or 100-150 people to large ones with a maximum of 200 people. There are six agricultural co-operatives which include wheat cultivation, the growing of vegetables and salad materials, one which produces milk and makes yoghurt, one which sells bread, two involved in animal husbandry i.e. goats and sheep, two shops, a small one run by four women and one selling second-hand clothes, a restaurant that also makes and supplies bread locally, one grocery shop with 75 shareholders, an oil refinery, an orchard and one mixed agriculture co-operative run jointly by Tev Dem and Kongira Star. In keeping with the revolution’s goal of environmental sustainability, a bio-plastic manufacturing unit of 90 people is also being set up, another mixed co-operative under the joint control of Kongira Star and Tev Dem. The Women’s Economic Committee are in the process of setting up a committee for a chicken co-operative to replace a failed co-operative. The Women’s Economic Committee had provided the land for a chicken co-operative but all the chickens died in the winter because of disease. The new co-operative will follow free-range principles (translated as ‘a more natural way’) and be started up in a place at some distance from the village where the first co-operative was based as they believe that their chickens picked up a disease from the village chickens. All of the women who work in the co-operatives are also the owners/shareholders but in some co-operatives, they might hire men as workers. The co-operatives are run on a non-hierarchical basis. Even the preferred term for ‘management committee’ is ‘co-ordinating committee’ because it sounds less hierarchical. The workers/owners elect the co-ordination committee at their meetings. They collectively decide on the rules, choose the finance worker, how to use the money, whether to distribute it on an equal basis amongst all the shareholders or whether to reserve some of it for other purposes. For example, the milk co-operative in Derik, decided that they needed a car for the children’s nursery, so they set aside a share of the profits to buy a car. Every co-operative makes its own decisions and works according to those decisions. The rules vary but a handbook of the kind of rules that co-ops should consider is published by the Committee. Decisions are taken by a majority vote. During elections, they vote by a show of hands or secret ballot. Their rules specify whether they need more than 50%, 60% or 90% to constitute a majority vote. When there are problems in the co-operative, the shareholders assemble and may vote in a new co-ordinating committee. Rules also cover issues like the disciplinary procedure: for instance, if someone does not turn up for work for two or three days running, they will be sent a warning after which a decision may be taken that if she doesn’t turn up for work she will not be part of the co-operative any more. Although these rules are decided by the co-operative members, the Women’s Economic Committee provides training on how to set up and run a co-operative. Their training sessions cover issues like what is a co-operative? They gave an example of a co-operative of goats with 50 shareholders who came together and formed an assembly, they would be trained in the business of rearing goats, selling goats, and making cheese. If they wanted to sell their cheese, the Committee put them in touch with another co-operative that sells cheese. Sometimes the people who come together to form a co-operative would be familiar with the business that they wanted to set up and would not require training. ‘The Women’s Economic Committee are going to start a co-operative for rearing goats. Any woman who wants to join this co-op, has to pay a hundred thousand Syrian pounds. (At the dollar exchange rate on the black market, this equates to $230. There are very few banks in Rojava and Qamişlo, the capital city has only one bank)’. As that is a fair amount of money, shareholders are allowed to pay in instalments. When I suggested that the process of identifying need sounded top-down rather than bottom-up, I was told that it works in a variety of ways. At the level of the commune, there is an economic committee. They call a meeting of the commune at which it might be decided that they would like to set up a cooperative. They draw up a proposal and hand it in to the Committee which then steps in with advice, training, land and credit, if necessary. Initially the Committee will send representatives to the meetings to guide the co-operative although decisions will always be taken by the co-operative members. When the co-operatives are running smoothly, the Committee stops attending their meetings. If there is a problem, sometimes the co-operatives will come to the Committee for assistance. The Committee also runs training sessions on the economic theory of co-operatives and ideological justification for alternative economic models. If a co-operative fails and the investment is lost the Women’s Committee will give whatever assistance is required including financial help to the families. Delal Afrin gives the example of the fruit trees co-operative which covers 40 dunams of land and is owned by a co-operative of six women. (A dunam is the Ottoman unit of area roughly equivalent to the English acre, representing the amount of land that could be ploughed by a team of oxen in a day.) They are planting trees now: apricots, apples and so on which incidentally they were not allowed to grow by the Assad government which wanted them to be reliant on the South for their fruits. One of the problems is water: to dig a well, they need 6 million Syrian pounds. The costs are high because they have to go very deep. The Committee loaned the money for the well. If the project succeeds, they will return the loan and if it doesn’t, then they will default on the loan but will face no penalties. In another example, Delal says that if there are 50 women who want to set up a co-operative and they are able to contribute only 500,000 Syrian pounds but they need 1 million, the shortfall will be made up by the Women’s Economic Committee and returned only if and when they have the money. The Committee receives 1-2% of the profit generated by each co-operative. Profit is divided up differently in co-operatives depending on the decisions made by the members. It is usually divided up as follows: 50% for the people who work and participate in the co-operative, 25% is invested into the co-operative’s development and growth and a percentage is set aside for the needs of the commune, like health and education. The needs of the commune and the co-operative are prioritised over the needs of the Committee. The people that are working in the co-operatives are also members of the commune. The Kongira Star communes, which are women-only, are independent of the Tev-Dem structure which are mixed. She reached back into history to explain what happened to women in patriarchal societies. In the Middle East, during Neolithic times, ‘the street was open to the women’. For hundreds and thousands of years, women have been told that they are not able to do anything so they no longer have confidence that they can do anything. It’s also about loving each other as women, loving the fact of being women. I ask if she means solidarity, no she stresses, not solidarity but love, to love life, to love their own life, to organise and to learn. ‘With the rise of patriarchy, women lost these freedoms and were oppressed not just in this region but all over the world. Women are attempting to overcome the past. The rights of men and women should be the same regardless of the differences between them. The historic imbalance of power cannot simply be corrected by introducing quotas for women or the principle of co-presidentship shared by one man and one woman. The confidence that men and women bring to the job will be different unless the confidence of women is built up through the self-reliance, knowledge building and training they acquire in the setting up of co-operatives. A society that is able to organise an economy where women are given productive roles is the sign of a mature and reflective society. When the economy is not in the control of men, women will be able to express themselves freely. The freedom of the woman will promote the freedom of the society and of the man. When both men and women become free we will achieve a free society. Absence of finance is a very big issue. Delal explains how their plans for making tahini from sesame are frustrated by cost issues. The machine costs $10,000 to make tahini and has to be imported. Just 10 machines would cost a hundred thousand dollars and cannot be covered by contributions from shareholders. She says these machines would provide employment for at least 300 women as they would need a hundred women to work in the co-operative, another hundred women to grow sesame and another hundred women to sell it. ‘We’ve got the people. Nor is the place a problem. The problem is the money.’ I ask whether it would be difficult to import it when there are trade embargos. She says, ‘Sometimes the border is closed, sometimes things come in. They cannot prevent it if it is something that is really needed. They have to let it come in.’ They succeeded in obtaining machinery that Kobani needed for reconstruction. Similarly, they were able to persuade the authorities to let sugar, flour and other scarcities come through. For example with bio plastics, they needed a certain kind of nylon, some things came from Bakur (Turkey) and some things came from Bashur (KRG) but because the borders are closed and they couldn’t get their requirements from Damascus, they could not start the bio-plastic co-operative this winter. Delal Afrin would also like to set up an oil refinery co-operative which would require sums of money that are beyond their reach. However, when I speak to Hediye Yusuf, the co-President of Rojava, she believes that oil is a resource for the whole society and therefore needs to be collectively owned rather than by individual cooperatives. Yusuf believes that the profits from selling oil should be collectivised and the money should go to the municipality to be used for projects for the benefit of the whole community. She believes the same applies to electricity. Skills can also be an issue. Although they have a few people with skills in, for example, the bio plastics industry, there are shortcomings in knowledge such as understanding whether the land is good enough for cultivation or how to extract water without causing problems; the second problem is finance; the third major problem is borders. ‘The closure of the border is a political decision to deprive our people of basic necessities, this is why we want to organise the economy to enable us to be self-sufficient,’ says Delal. The Kurdish regions were historically underdeveloped by Bashar al Assad’s regime. Kurdish people were forbidden from planting trees or growing fruits. Mainly wheat was cultivated in Northern Syria. The Kurds were prevented from being economically self-sufficient; everything was connected to Damascus. The wheat was sent to Damascus. Rojava is rebuilding its economy from scratch which is proving difficult. It was especially difficult for women because they were not actively involved in the economy. The co-operatives are based on the land of the people, now owned by the Economics ministry and the Women’s Economic Committee and given to co-operatives as needed. Some land was taken from the Kurds by the Assad government but the Kurds have taken it all back. Afrin was unable to provide an estimate of the amount of land in private hands. On the question of what the international movement can do to show solidarity to the Co-operative movement in Rojava, Afrin said they have ambitious plans and would welcome further discussions with ‘the people of the world’ and how they can support women in Rojava. They would like to establish an Academy for Feminist Economics so that women can learn about agriculture, health, animal husbandry, and confidence building. I put some broad economic questions to Hediye Yusuf. I discovered it was really difficult to get precise answers about funding. Many interviewees claimed that it was donations from individuals which helped to finance projects, a trend that started before the revolution. Rojava is self-sufficient in food and oil. Since the revolution, the majority of the population are working ‘with their heart’, voluntarily or for meagre wages because they believe in what they are doing. I asked if the model of Western economic success which is assessed in terms of growth fuelled by increased consumption was relevant to their experience, especially as people in Rojava did not appear to earn enough money to fuel economic growth. Yusuf insisted that there are incomes and jobs connected with import-export and there are some big projects and factories but being at war distracted their focus from the economy. The closure of the borders has an impact on exports; there are many products that could be exported because Rojava has resources. The trade embargo puts an upward pressure on prices as many goods come from southern Syria but face several ISIS checkpoints where taxes have to be paid to ensure the onward journey of the goods. This causes serious deprivation for local people. A small grocery shop owned by four women which is barely four months old. It was doing well so the women had expanded the quantity and range of goods they stocked. Warshin sewing Co-operative owned by 8 women which also employs four men. 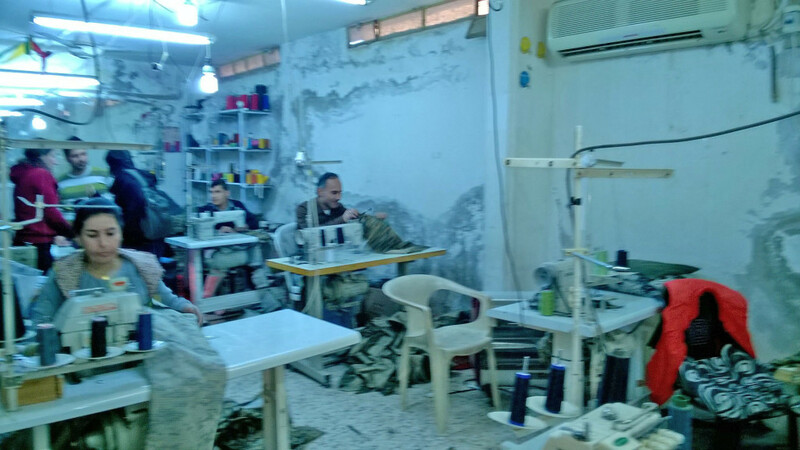 A large part of their work involves supplying YPG/YPJ uniforms and flags. Hevgirtin Co-operative – a wholesale distribution outlet supplying groceries, toiletries etc We are told it is a women’s co-operative but when we visit we see only men and do a short interview with two of them. They have been in operation for two months since January 2016 and are expanding fast. Fifteen people are working at that site and there are 70 workers across the canton of Cizire. There are 10,000 shareholders each of whom contributed 15,000 Syrian pounds (about $35). Most of them work in the co-operative. Everybody is paid the same amount of money. As they are so new, the system is not fully established. The work of this co-operative is driven by their opposition to price increases. ‘We are against the black market and monopoly.’ As the borders are closed, things have become very expensive. The goal is to decrease prices in the souk i.e. the open market. They do not need a lot of capital to accumulate capital as they are not here to make a profit. They share the income. Interestingly, the private sector is not hostile to them as it too is benefitting from their cheap supplies. Decisions are taken by the workers as they are familiar with the work. At the Qamislo site, there are 15 workers who take decisions along with the co-presidents. A restaurant in Derbasiye, which also bakes bread for local people, has been in operation for 6-7 months. I was told that this is a co-operative but it turns out to be a regular business funded directly and owned by the Women’s Economic Committee. So there is a third model which we stumble across quite by chance. All profits are returned to the Committee which made the initial investment. There are eleven workers, 9 women and 2 men. We speak to the woman manager who tells us that they employ two men to carry out jobs that are traditionally done by men – one chef and one manning the oven. Their bread is doing so well that they are planning to invest in another oven from their profits. The workers’ wages are topped up with bread which they are allowed to take home.